An opportunity to hear about changes occurring in the DC Water Small Diameter Water Main (SDWM) Specifications, learn more about Good Faith Efforts, and provide feedback for future consideration by DC Water. On Thursday, August 17, news sources began reporting that the Trump Administration will abandon its Advisory Council on Infrastructure that was formed in his July 19th Executive Order. This news comes from an unnamed White House official after President Trump disbanded both the American Manufacturing Council and the Strategic and Policy Forum in the wake of the Charlottesville, VA protests response. The Advisory Council on Infrastructure was intended to advise the administration on to fund, support, and deliver $1 trillion in infrastructure projects that President Trump campaigned on last fall. The President had tapped two New York developers to lead the council, but no other appointments had been made. Despite the disbanding of the council, senior White House officials still claim hope for an infrastructure panel this year. 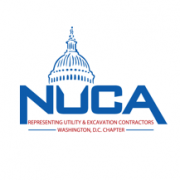 NUCA will continue to press the Administration and Congress for a comprehensive, robust infrastructure plan. While the disbanding of the council may be a setback for the plan, it may also be an opportunity to prioritize the water, sewer, transportation, and energy infrastructure upgrades that will make a significant and meaningfully positive impact on Americans daily lives and the economy.